A cool, green waterhole in the dripping depths of Carnarvon Gorge. 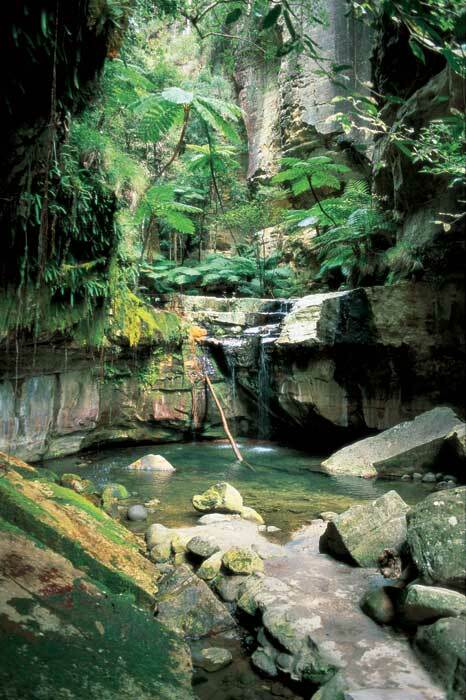 The second of our top ten Australian day walks, Carnarvon Gorge is a Queensland trek highlight. A gorge like Carnarvon is custom made for bushwalking. Gouged up to 200m into the earth, it’s shaded, has ample water and is chock full of features, from rock art sites to swim holes to cool nooks stuffed with pockets of rainforest. Carnarvon Gorge – Queensland’s answer to the Kimberley? The walk begins at the gorge’s eastern end, following Carnarvon Creek as it zigs and zags beneath towering yellow cliffs to Big Bend, where a large pool makes for a good half-time dip before you retrace your steps back through the gorge. Along the way, there are extensive rock stencils at Cathedral Cave and the succinctly named Art Gallery, and detours into the dripping rainforest gullies of Moss Garden and Ward’s Canyon. Around 500km inland from Rockhampton, and 700km from Brisbane. This one’s got the lot: jaw-dropping scenery and a couple of the finest Aboriginal rock-art galleries in the country. Ward’s Canyon, which shelters a number of king ferns. The largest fern in the world, its fronds are up to five metres in length. Not difficult, though it can be a long day, so a fair level of endurance will make it a more comfortable outing.